This time last year, Jochen was in quarantine and we were both counting the days to when we would be able to bring him home. I was spending every day allowed me to visit him and stayed to the last possible second. Since being out of quarantine, Jochen's health has been of some concern. As I wrote in my last update many months ago, it took him quite a few weeks to get back to normal. He was confused and dare I say, a little depressed as well. Lots of walks and working helped him to get his balance back. His voice took weeks to recover and even now, at times he still sounds hoarse. However I think this is a combination of the retro-pharyngeal infection he had early last year plus the strain he put on his voice barking all night every night whilst in quarantine. He turned 9 on 19th October, 2013 and although it hurts me to say this, he has slowed down and is now a senior dog. 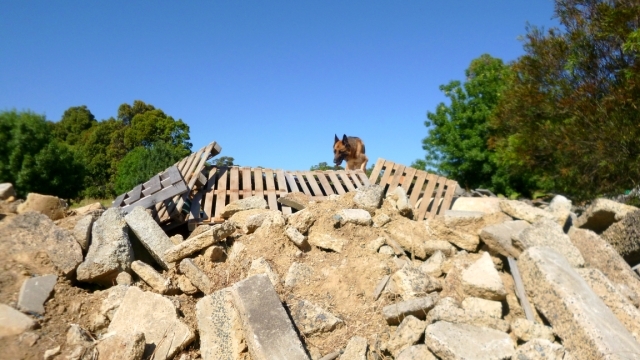 He still loves the search work on a rubble pile and is still as good as he ever was. Naturally, however, he is not quite as flashy anymore and therefore not quite as fast either. In late April he fitted and I thought he had had a stroke. This was of course a panic trip to the vet who thought he might have had vestibular but was not quite sure as he was a bit young for that. Also, he had recovered by that evening and I was able to take him home. Apparently it usually takes about three weeks to recover and sometimes there are still signs twelve months later. There has been no sign of any fitting since that time. However, at the same time the vet took his blood pressure (who knew that dogs can have high blood pressure?) and it was VERY high. So high in fact that the vet took his blood pressure three times with three different cuffs. That sent me in a tailspin all over again. Well, Jochen and I have been home from Switzerland for 6 months now and Jochen has been out of quarantine for five months. It seems hard to believe that this time last year Jochen had barely recovered from his retro-pharyngeal cellular infection and the strong antibiotics and penicillin he was prescribed. He was barely able to walk a kilometre without visibly tiring and I was agonising whether I could or should subject him to the rigours of the flight and the hectic three months we would be spending in Switzerland, not to mention the quarantine on return to Australia. It was actually touch and go and this is why I waited until the last possible minute to make bookings for us both. I never did write about Jochen's health scare last year. It started at the end of January 2012 when it seemed that he had contracted kennel cough although his and Liesel's immunisations were up to date. Liesel never caught the infection from him although his infection seemed to drag on for weeks and weeks. Several trips to the vet kept confirming that he was still infectious. There were a couple of days when he seemed to have difficulty swallowing the hard 2 x 2 biscuits and then I noticed a very large lump on this throat and when a touched it, he gagged. Back to the vet. As this lump was large, hard and diffuse, two vets thought he had cancer. I made up my mind then and there that if it was cancer, I would not allow chemo or anything else, make him comfortable for as long as that was possible and then do the obvious. I had to leave him at the surgery and x-rays and ultra sound was done. Another two vets checked out Jochen and the x-rays and ultrasound pictures. The short story was that he did not have cancer but most likely retro-pharyngeal cellular infection. Not only did he have that lump on his throat, he also had a mass of infection between his voice box and spinal cord. Given where this mass was, surgery was out of the question. He was a very sick dog. Retro-pharyngeal abscess (which is more usual) is like strangles in horses. Also, children under the age of 5 can get this too. How or why Jochen developed this infection will forever remain a mystery. The vets said that somehow bacteria made its way into the area of the voice box and started spreading. It was a very stressful and worrying time, and yet, here we are, 12 months later, fully recovered from that infection and medication, the two flights, quarantine and three wonderful months in Switzerland rich with experiences, learning, countless treks in the mountains and so many training training days all over Switzerland. On our daily walks, I can so easily transport myself (and of course Jochen as well) back to those trekking experiences in Switzerland, almost as if we were back there. So one part of me is in the Australian bush, gum trees and the smell of eucalyptus and another part of me is in the Swiss mountains above the tree line - weirdly wonderful. Jochen is bored unless I work him. Going for a walk twice a day is better than nothing and he does get quite excited when I show him his collar and lead. However he really only fires up when he is working, be that obedience, detaching, searching for articles or working on the rubble pile. He is a 'good boy' and does not nag me to 'do something', he just sighs and lets everything hang, lips, head, ears....the saddest look imaginable. 'Stop it,' I say to him, and he hangs his head even more. AARRGGHHH! It is of course impossible to even partially reproduce all those walks and training in exciting places. Firstly, I am back at work and so time is short, and of course we do not have access to the walks that are in Switzerland - 60,000 of walking trails! Secondly, our highest mountain is in New South Wales, about 1,000 km away and not really all that high. In any case, it is a national park and so dogs are not allowed. It is true to say that we are both suffering somewhat from withdrawal symptoms. Next week I will be giving a presentation on our work and trip at the Eastern Branch of the German Shepherd Club and two weeks later we will do a demonstration after their Sunday morning training. Jochen interviewed by SBS Radio! Well, I guess Jochen was not really interviewed but he did add his voice which is almost back to normal. Whilst Jochen and I were in Switzerland, I received an email from Christian Froelicher who happened to find this blog whilst he was surfing the internet looking for people doing interesting things to interview. He liked my blog and agreed that once we were back in Australia and Jochen was out of quarantine, we would do a radio interview for the German segment on SBS Radio here in Melbourne. The interview whilst walking along the banks of the Yarra was a lot of fun. Christian asked if we could do it in Swiss German (he is Swiss German himself) but I am afraid my language skills and courage fail at that utterly. No problem, high German it is. Christian was great to work with, friendly, easygoing and asked sensible and interesting questions. He clearly likes dogs and you can see in the photo that Jochen thought he was an OK person. In preparation for the Foundation Skills Test we conducted for one of our members, Peter and I spent a whole day building four new hides. As I wrote in the blog whilst in Switzerland, one of the training difficulties we have in Australia is the dearth of proper disaster sites. The South Australian task force has a very good one at Angle Park where we do our operational testing, but for regular training here in Melbourne, we do not have adequate facilities. This is especially so in respect to basements and tunnels. Dogs must learn to go down into the dark to follow the human scent cone as close to the source as possible. We were not able to build basements and tunnels but given how some of the concrete was piled up for us earlier this year, we were able to make use of this lucky configuration and create one very high hide, meaning that the 'victim' was a long way down but the dog had to work to get to him/her. This requires a dog who is confident on unstable and unusual surfaces and who has a strong drive to get to the 'victim' working in around the hide to find a way in. We do not actually want the dog to get to the 'victim' but we do want the dog to overcome difficulties to get as close as possible. Why do we not want the dog to actually get to the 'victim'? Because the dog must alert on human scent only. If the dog manages to get to the 'victim' often during training, he/she may develop the tendency to walk off as human scent only may not be a strong enough motivator to stay and alert. We have often been asked how we start a training a USAR dog? Usually it starts with what is called a 'bark box'. In the photo you can see a box between two drums. The front of the box is a slider with a long rope attached to it. The slider has holes drilled into it at the base for human scent to escape and a lot of sand is placed in front of the box so that the dog is encouraged to dig. Most dogs like digging in sand. (A dog who digs energetically in the sand at the base of the bark box, or scratches at the lid itself, shows very strong penetration drive, which we love to see). By means of the long rope, the slider can be raised or lowered at a distance from the bark box. Obviously the following is the merest introduction only and there are many steps and adjustments made along the way depending on how the dog performs. So please don't think that you can now go out and teach your dog the bark alert! It may work for you, but it may not. All of the work is motivational, the dogs are not corrected and we make sure that the dogs are not overworked. We finish when we know that the dog still has energy for more work. Initially and for some time to come, the focus is almost solely on the dog. The handler has the task of bringing the dog to the exercise whilst the helper/victim is the most important person in the training regime. The dog is taught by the handler to bark on command first. The bark on command exercise is transferred to other people in the group and once the dog is comfortable working for other people even at a distance from the handler, we can work at the bark box. The dog is introduced to the open bark box by the handler by both going into it. If the dog is fine, he/she will be asked to bark in the box. Some dogs take a little while to get used to being in a confined space with their handler, never mind another person. Barking in a confined space for the first time can be a little intimidating for some dogs at first too. The dog is held by a helper, the handler takes the dog's favourite toy or food and calls the dog whilst running up to, and into, the box which is left open. The dog is released and usually of course the dog will run straight into the box to his/her handler. The handler motivates the dog to bark in the box. Usually this only needs to be done once or twice in a row. The next step is to have the handler in the box with the lid lowered about halfway. This creates a visual barrier and is something the dog has to overcome. For some dogs this is no problem and others hesitate. We then have to deal with this hesitation appropriately. The aim is to get the dog to dig and bark at the closed lid for his/her handler with the lid or slider all the way down. From here we progress towards using a helper who will have previously been in the bark box with the handler, but with the handler behind the helper so that the dog 'finds' the helper first. This person will become the 'victim' in the bark box for the next few training sessions and the handler from now on handles his/her own dog. For quite some time all this work is via motivation. That is, the dog sees the helper disappear into the box. The lid is raised or lowered as required as a reward for whatever action/behaviour we want to encourage in the dog. This exercise forms the foundation of all canine USAR training and is developed and expanded as the dog grows in confidence and performance. The formal bark alert is a normal part of training and is part of the rest of the USAR dog's life, including the operational dog. We use the bark box to refine the alert behaviour, to iron out any problems that may have arisen, to help a dog overcome any sensitivities it may have and to set up special challenges for the dog under controlled conditions that we can later transfer to the disaster site. Once the dog is advanced, this more creative and challenging work is also fun and keeps up their interest. As Jochen has a tendency to want to get to the 'victim' pushing his way through or even removing debris to get closer, we have had to make sure that he cannot get in, sometimes with not success. We have been sure that this time he cannot get in but has still found a way. We have placed the most amazing array of drums, pallets, tarps, timber and whatever else we could place in front of and around the bark box to so that he would learn to alert from a distance when he cannot get any closer to the scent source. This habit of trying to circle in on the 'victim' was at times an issue in the more complex disaster site in Switzerland. Never having faced such complex situations before, he would on occasion take quite some time before he was convinced that he could not get any closer. In the above photo in the basement at the 'Salvador' site, he took quite some time before he settled into an alert. It needs to be understood that the air currents and thermals in such a building are very difficult and the dogs are given all the time they need to sort it out, a most fascinating experience. Before it became too hot and uncomfortable, I took Jochen back to our (ASSDA) training site to show him the changes that Peter and I had made on Saturday to the disaster site in preparation for the test. I took him over the agility course, something he has always enjoyed and is very good at. So he can't complain that he 'only' gets long walks. As far as he is concerned, walks are super but WORK is even better. Disaster search dogs have to be agile, mobile and steady on unstable terrain and for the dogs to learn this, an agility component is part of the Foundation Skills Assessment. This agility is not to be confused with the sport of agility which is done at speed and on purpose-built obstacles. In our disaster world, and from a training perspective, the obstacles are open to our imagination and whatever material is available to us. As you can see, 44 gallon drums come in very handy. We change the set-up from time to time so that the dogs don't become blasé. Jochen loves going over them. Jochen reaches the top of the ladder. And then there are the horizontal ladders as in the two photos below. We have a 'starter' ladder that is much lower to the ground and the rungs are wider to help the young dog and/or the beginner to get used to the horizontal ladder. After all this work he was a much happier dog and was ready to go home, which was just as well as the Australian summer sun was starting to bite. Jochen's weight has been a concern for some time. Because both of us walked and walked and....we both lost weight. Those who know me would say it is not possible for me to lose any weight as I am already so tiny, but I did. So did Jochen. I really pumped food into him in the weeks leading up to the big test and at the final weigh-in and vet check prior to leaving for Australia again, he had put on just over 2 kg. When he arrived in Melbourne, he had lost all that again and as I had written previously, the quarantine staff agreed to feed him twice a day. Over the course of about 10 days he put on 600 grams. Not a great deal but something. Well, he came out of quarantine yesterday week ago and I weighed him at the vet the next day. He weighed only 32.7 kg!! Today, a week later, he weighed 33.8 kg which is already much better. He was always a difficult dog to put weight on and the stress of being in quarantine, barking all night, trying to climb out of his pen, meant that putting on any meaningful weight was just not going to happen. He is more settled and has no need to follow me everywhere I go. Life is back to the normal humdrum of our particular household and he feels at ease. However, his voice is still hoarse and he rarely barks. Normally when I put on his lead an collar to go for a walk he becomes very noisy in anticipation of the wonderful walk we are going to have. He did that for the first time on Sunday since he has been back home. But is was a very funny voice ranging from a squeaky noise to a hoarse bark. 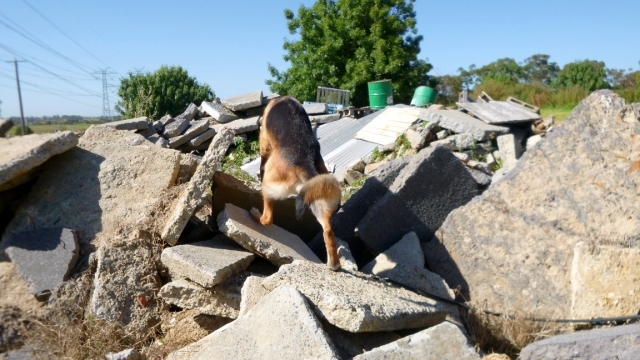 These photos show in part a very important disaster search exercise that all dogs must learn as part of the first rung of the assessment ladder. The obstacles are set out in a star shape with the starting line being one point of the star, and are about 20 paces apart. The dogs must come back to the centre obstacle each time before being sent to the next obstacle. In the photo above, Jochen is on the far exercise and is waiting for direction to come back to the centre one, the pallet stack. The dogs must remain on each obstacle for 5 seconds before being directed back to the centre and on to the next one. We did this exercise today as our training ground had been prepared for the Foundation Skills Assessment we (Australian Swiss Search Dog Association Inc - ASSDA) held for one of our members yesterday, Sunday, 9th December 2012. As you can see in the photos, the grass has been cut and so it is safe to use the area - meaning any snakes can be seen easily! Jochen on the right side of the Aqis fence! It felt as though the day of Jochen's release from quarantine would never come...but it did. From counting the number of sleeps I came to counting the number of hours! Yes, I freely admit it, I am slightly mad. I woke up about every two hours and by 6.00 am I gave in and got up. I found that the closer it came to the release day and time the more anxious I felt. I had visited Jochen for two hours on Friday and told him that he was coming home in two days. This morning I kept saying, ' You are coming home. We are coming to get you.' As if he could hear me. Really! Peter and I arrived with the box trailer bright and early. I pushed the green button, the small gate slowly opened whilst the big double gate creaked open to allow Peter to drive in. I had to sign some release papers and I was too fixated on getting to Jochen to think of taking my glasses out so I have no idea what I signed. I charged out and whilst Peter was still backing the car and trailer, I opened the car door, grabbed Jochen's lead and collar and raced over to Jochen's pen. He greeted me with his usual exuberance but with barely a squeak. His voice has almost totally disappeared, he is that hoarse from barking all night. Jochen dragged me out of the pen and cross the yard to our car determined to GO HOME! I had no control whatsoever - I would have done Mary Poppins proud. He threw himself into the back of the station wagon whilst Peter loaded up his travelling crate. Tony, Aqis staff member who had shared the care of Jochen with Vicki, gathered up the rest of his belongings - toys, bedding and extra hammock bed and helped stow it all into the car. It was not until Jochen was in the car and the door closed that I realised how stressed and anxious I had been to get my dog out of quarantine. As soon as I closed the car door, I felt this sense of overwhelming relief. I had always known that this quarantine episode would not be easy but it was harder than I had imagined it would be. Jochen free on our training site field. About half-way home he lay down and slept. Back home we unhooked the trailer, collected Liesel and drove to our training site where both dogs could run freely. This is the first time since the final walk the three of us had at Zurich airport on 31st October, 2012 that Jochen has been able to stretch his legs. it seems as if a life time has passed since then. Retreat seemed sensible and so we headed down the embankment to the internal road - ugly, uninspiring but not a blue-tongue or a snake to be seen. With all the hard work and countless kilometres of trekking we had done in Switzerland, I had had a hard time keeping weight on Jochen. From Monday the 29th October when he had his final vet check to the weigh-in at the Melbourne quarantine station on 2nd November, he had lost 2 kg. This was a lot and the staff agreed to feed him twice a day to get some more weight on him. In a week he put on 600gm but that was about it. In fact, I think he lost that again and possibly some more. I think the stress of being isolated at night, not being able to sleep with his 'family', especially after the almost three months we spent together, and therefore barking all night every night (as I was told he did) meant that he did not get enough sleep. In not getting enough sleep and rest, he must have burned up so much energy that no amount of extra feeding was going to make the slightest difference. He was fine during the day, it was the loneliness and boredom of night time that he did not cope with. Even such a sound and even-tempered dog as Jochen does feel stress. If that sense of inner balance and well-being is missing, then the organism is going to suffer and Jochen is no exception. I always made a point of being very cool and matter-of-fact both when I visited him and when I left him. Jochen did not need me to weep all over him because he was in quarantine. I never turned around to look at him once I left him no matter how much he barked and I never made a fuss when I entered his pen. The time we spent together during visiting hours I also kept low-key as I figured this would help him best. It was interesting to observe Jochen's behaviour once we were home. Naturally he checked out the whole back yard, sniffing, marking, making half-hearted attempts to play with Liesel, but he was not settled. He seemed a bit remote, he was not smiling, and at times he even seemed a little confused. I went about my business watching him but leaving him to find his own way to understanding and accepting that he really was home again. After I had mowed the lawn I settled into a chair in the back yard and he lay down close to me and finally stretched out on his side. In the early evening Peter and I took our two dogs for a short walk in our local area. Well, I had forgotten how strong he is. I had him on the show collar and lead, he pulled as if he were in training for the National, his hind quarters dropped low and driving hard whilst his front was up and his head on a swivel. He was looking for action, man. This was another 'Mary Poppins' moment for me! After this walk and his third meal for the day, he looked as if he now felt and believed that he was really and truly home. He has a lot of sleep and recuperative rest to catch up on and I am expecting that will help in putting weight on as well. I cannot thank the quarantine management and staff enough for the care they gave Jochen and how they worked with me to ensure that within the rules and regulations they must abide by, they did the best they could. He was very popular with all the staff that had anything to do with him. BUT......quarantine is quarantine and I am very, very thankful that this episode is behind us. The project that the German Shepherd Community and private persons so generously supported, is concluded with Jochen's release from quarantine. There will no longer be the almost daily reports of our latest train journey, crazy walking in the high mountains or chasing training days and workshops. Neither will there be those super photos of a most beautiful country, but Jochen's and my journey is not yet finished. We have more to do once he has had enough time to recover and just be a dog. Jochen is fit and healthy and is good for a few more years of USAR work. So you wonderful people out there, please do check in on Jochen's blog as I will keep it up. The blog will of course take on a different tone but I will do my best to keep it interesting and worth reading. So do tune in and please, feel free to ask questions. I am available for presentations and workshops on the work that we do should any club or branch be interested. I was so pleased to see Jochen relocated into this block of pens. As you can see, this pen is bright and light. In addition, he can see out and watch the world go by so there is some stimulation to alleviate the boredom of being confined to a pen day and night after having been on the go for three months. I cannot thank the quarantine management enough for accommodating the needs of this service dog, for that is exactly what he is - a service dog. It is interesting to note the attitude of the owners who come to visit their dogs in quarantine. It is so obvious that no-one is happy with the quarantine situation (I'm not either of course). There is a sense of frustration and irritation - and also helplessness because we do not have any choice in the matter, and I found that I had to be very careful not to get into any conversation beyond the mundane. Some people were looking for things to complain about as a way of expressing their frustration and helplessness. Other than the fact that the dogs have to be in quarantine, there is nothing to complain of. Staff and management do an excellent job and I have found them to be friendly, accommodating and sensitive to the needs of the dogs. It is just that quarantine is an institution and not home where we want our dogs to be. My frustration is that New Zealand has reduced its quarantine time down to 10 days already whilst Australia is still thinking about it. So in my mind the extra days that he has to be there seems so illogical. As per usual on every visit, I brushed him and went through the usual check of ears, eyes, pads etc. The lines of rubbed-off coat on his hocks are still there of course. It will take a while for the fur to grow back. I did notice that his movement was not quite right as he was trotting around the grass run and felt the muscles along his spine. He did not show any reaction to that but when I felt the muscles in his left loin, he was not a happy dog. So I will make a Bowen Therapy appointment for him for as soon as possible after he is out of quarantine. I will never of course know for sure but in trying to climb up the cyclone fencing in his pen, he must have twisted in an odd way when he fell off, or tried to cling to the fencing, or whatever he did and that is probably when he pulled some muscles. Looking at the construction of the pen and the size of the dog, it must have been quite a feat to be able to manage what he most likely did. However, it does fit to him given the things he has done on rubble piles. He is an odd, unusual dog with an odd kick in his gallop. I had noticed last Friday that he had some plaque on his canines. He had not had anything hard to chew whilst we were away and so I guess there had to be a build-up of plaque. So today I was armed with a plaque remover and a soft toothbrush and toothpaste and set to work. Fortunately he is such a good patient and is used to having his teeth looked at and on occasion cleaned, that this was no big deal for him. I managed to remove much of the plaque on his canines right down to the gum line although I will have another go the next time I visit him. There was some odd stuff on his molars which I need to have looked at but which is probably also plaque. But I am not a dentist and did not want to scrape on his teeth when I am not sure what I am doing. The canine plaque was obvious. He was a good boy and put up with this poking around on his teeth. He even coped with the toothbrush and toothpaste! I am actually considering using the electric toothbrush next time. At the next visit to the vet I will get his teeth looked at to ensure that all is well. Jochen in the quarantine grass run. On this photo it is quite clear by the expression on his face that he is a happier dog. We had of course already done a lot of work plus being brushed, teeth cleaned etc. So his need for action and stimulation to relieve the boredom had to some degree at least been addressed. Tongue-in cheek, the manager said that I should have hardened him up before leaving for Switzerland. I said the neighbours would have killed me! FIVE DAYS TO GO BEFORE JOCHEN IS HOME!!!!! Some of us did some brain storming on what could have caused the lines on Jochen's hocks and came up with the possibility that he may have tried to climb out of his pen by climbing up he cyclone fence. He is not the dog who would mindlessly throw himself at a gate or fence to get out. He is the type who thinks his way through a challenge and it would fit to him to attempt to climb out. He would do this with focus and determination. If this is what he did do, it would have been at night when nothing is happening and no-one is there to see him. One week to go!!!!! Jochen comes home on Sunday, 2nd December. I can't think about much else. My almost total focus is on Jochen being home again. Today was the 5th visit to Jochen in quarantine. It is of course the same story. When I enter his pen he is beside himself with joy. I make sure that I can see him in the afternoons as the visiting time is two hours. Therefore the afternoons are the most popular and I learned very early to be at the gate at least 15 minutes early to ensure that I can claim an outside run. I have developed a routine where I am usually one of the first through the gate when it is opened, charge into the office, sign in, charge out, claim a run with shade, dump my bag as a sign that the run is occupied and then get Jochen. At times like this I have no difficulty in being totally selfish on my dog's behalf. I work this routine with a single-minded determination. Something odd has happened to Jochen since my visit on Friday afternoon. As soon as I released him into the grass run, I noticed an odd line, light in colour, on his left hock. On checking it out it looked as if someone had taken a razor blade and cut the fur in an upward line from the inside to the outside of his hock or, there was something like a wire that had been rubbing on the coat. Stranger still was an almost identical line on the right hock. The skin was not broken and he showed no pain when I pressed the area. Neither is he limping. It is not conceivable that anyone would have cut the fur or had wound anything around his hocks and neither is there anything in his pen that could have created these strange lines on his hocks. I told the manager who had a good look, and Jochen's carer was questioned who assured me that nothing has been done or any incident happened that could have caused this wearing away of his coat in such an odd way. We are all totally mystified. We agreed that the coat could not wear down to such a degree in only three days. If he had jumped up and caught his hock in the fencing (which seems impossible), he would have had an injury, and he clearly hasn't, and then there is the question of how come on both hocks? Peter asked me if I had taken a photo but naturally I did not think of that. I was too busy trying to figure out what might have happened. Jochen seems not to have been harmed in any way at all but I am not happy. Something happened to cause this change in his fur. My frustration is that I cannot do anything about the fact that he is out of my care. I brush him at every visit, check his eyes, ears, teeth, nails and pads and would almost know if a hair was out of place and I know that these lines were not on his hocks on Friday. It was very warm today and whilst he was of course glad to be out of his confinement and we did the usual, he lacked energy. He was not quite himself. As resilient and laid back as he is, I sense that he has had enough and the isolation is getting to him. He needs the peace and security of his own home. 10 more days to go. I can hardly wait. This blog is to keep you updated on Jochen & Elke's journey to Switzerland to become a qualified USAR dog team at the highest level. Please add a comment & feel free to ask questions. And please send this link to anyone you think might be interested.